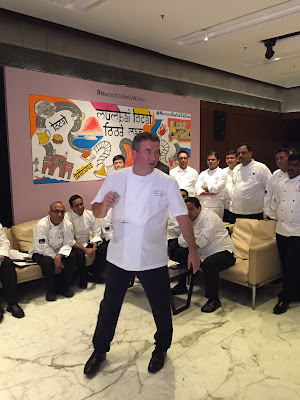 Is it time for 5 Star hotel chefs in India to think local? Most chefs that I have come across are happy people. From curry mee cooking grannies in Chiang Mai to idli steaming Tamil ladies in street food stalls in Mumbai. From people hosting paid meals at home to highlight food from their communities to people inviting you home to eat traditional dishes cooked by them. From people who show you how to cook on TV to home cooks doing YouTube videos. From those who cook in restaurants to chef de cuisines who head restaurants. From those who have come out of culinary schools to those who have taught themselves how to cook. People who love to cook and love to feed are happy people. There is of course a lot of debate on who can be called a ‘chef’. : “a person who prepares food for people to eat”. Well, there is no ambiguity about the bunch of people I was with a few days back at the JW Marriott Juhu. Around 30 executive chefs from Marriott properties across the country had collected there. With them was Toine Hoeksel who is based at Hong Kong and is the culinary director of Marriott Hotels in the Asia Pacific. The event was referred to as #MarriottChefsAtJWJuhu on social media. I was there as a part of a cook off where a few fellow bloggers and Instagram bloggers ( a new phenomenon) joined the chefs to cook and in the process got a feel of how it is to operate in 5 star kitchens and pick up some cooking skills too. Did we make some goat cheese ravioli globules or crab laksa foam with so many adroit 5 star hotel executive chefs around? Not really as Toine’s brief to us was very clear. It had to be ‘local’ Indian food. Chef Toine observed that the new generation of travellers apparently wants to go beyond familiar, comfort food while travelling. That travellers today want to experiment with local food. That too food served the way it has been traditionally. That people find this a great way of discovering local cultures. Which is why they are trying to focus on local food in Marriott Hotels. This desire to discover local food drove many who came to my Finely Chopped Food Walks I conduct in Mumbai. I had earlier seen examples of Marriott's local food emphasis in some of the Indian outposts of the US headquartered hotel chain. In Marriott Goa they have Goan dishes in the coffee shop menu using aunty Jyacinta's acumen and recipes. She comes to work at the hotel from a local village and has done so for more than a decade. During breakfast at a staycation at JW Marriott Juhu I saw that they have local Maharashtrian breakfast favourites such as kande poha and missal in the breakfast buffet at the Lotus Cafe matching shoulders with pancakes, waffles and cold press juices. Unfortunately, at both places I saw guests flock the international food counters and more familiar North Indian chicken tikka and South Indian dosa counters. But I am sure things will change. I have seen examples of this local food focus in a couple of Indian hotel chains too. ITC Hotels have this concept called 'Local Favourites' where they showcase food from the area the hotel belongs too. In ITC Sonar I had shukto and pabda shorshe as a part of a lavish Bengali lunch and kochuri and luchi for breakfast. They take this one step forward and have food sherpas (concierges, chefs etc) who take guests who are interested to local restaurants in the city to eat. They grow some of their herbs in house. Use local spices in panch phoron in grills in West View and get country chicken from the local village to sous vide. Again in Kolkata, I had local kochuri chaat served in shaal leaves, just as it is on the streets of Kolkata, and a very authentic granny's cooking-like Bengali korai shootir kochuri and alur dom at The Oberoi Grand. I noticed that they have the Bengali kosha manghso on the menu of their multi-cuisine restaurant La Terrasse. Then there are examples like the Oberoi Gurgaon and Trident BKC which hosted the Rivayat festival showcasing lost Indian recipes. The latter is not that much about local food though but it propounds food heritage which is a good thing too. Chef Anirudhya Roy of Taj Land's End, Mumbai, has imported goat meat from Rajasthan ('better water and goats get to graze and exercise) and presented a home styled Sunday mutton curry at the Masala Bay restaurant. Not 'local' from a Mumbai point of view but very typically 'Indian' if one uses a broader definition. Toine Hoeksel said that his focus for the Marriott Hotels is on local produce and local recipes. I saw examples of other hotels using local produce in Kolkata again where both The Oberoi Grand and ITC Sonar used beef from the local New Market and Kidderpore markets. It is good to see an international chain restaurant director joining these Indian hotel chains in promoting local food. Come to think of I've had ragi dosa in Marriott Whitefield, Bangalore, and ragi is popular in Bangalore and local Goan choriz in Marriott Goa. So this is not entirely new for the Marriott groups but this focus is welcome. It will hopefully encourage local farmers and food producers too. If this happens, then I will hopefully get the benne dosas of CTR and MTR in Bangalore which were missing at the city's Marriott Whitefield or Sheraton Malleswaram when I stayed there a couple of years back. Would I eat local food in a 5 star hotel myself? I am not a big believer in eating in 5 star hotels I must confess. We like to put all our money into the stay at 5 stars. We love lavish room experiences and staying in 5 stars is a way of rewarding ourselves. We feel that we get our money's worth. The luxury a good 5 star hotel provides in its rooms is a discernible result of what we are paying for. However, when it comes to eating I prefer to go to local places and soak in the local flavour. In my experience, and I am saying this dispassionately, the food served in a popular street food joint or small family run restaurant is hard to match by a five star. Cooking good food runs in the DNA of these small places. It's all about passion and it shows in the food. And there is a charm to sitting and eating with locals which sterile 5 star restaurants often can't match. I have noticed that the regional food in 5 star hotels is usually served as a part of the multi-cuisine restaurant menu. Possibly because having a stand alone restaurant to serve local food doesn't make business sense for 5 stars. Well, whatever works. Putting regional dishes on the menu, even if at the coffee shop, is a start and more impactful than transient home chef pop ups. I have for long been advocating that 5 star hotels should offer food from the city they belong to for travellers to experience. I am glad it is happening. It's just that I am not convinced that the food I get would be really worth the huge premium I would pay to eat at a 5 star hotel. Specially if I am willing to go out and scout for the local stuff. I have not seen the same visible difference in the food (specially local food) served in 5 stars, as one sees in the rooms, that too after paying a lot lot more for it. It would perhaps work for me if I am in a meals included package and want to enjoy the resort or am on a staycation and want to enjoy the property and am far away from the city centre. What I would look for are how are the ingredients used at the 5 star property significantly better. Are they organic, artisinal, from local farms? Are they prepared from scratch? Are they different from what a street vendor would use? What is the research that the chefs (spending time with grandmoms in their kitchen, going to local street food places) to capture the local tastes and flavours. And plating. The plating in most 5 star hotel Indian restaurants is so staid. Bombay Canteen in Mumbai is an excellent example of a place where food is presented in a fresh and vibrant manner and yet looks like food you would love to eat and not specimens of esoteric modern art. Soam, again in Mumbai, is a great example of using ethnic brass utensils to make food look so appealing. 5 star hotels need to think beyond the same old white porcelain. Not that I am a fan of the sort of plating which is so esoteric that you wonder how the hell should one approach the dish. Bombay Canteen and Soam have struck a good balance. If you are a traveller who is short on time. If you are not familiar with the place you are visiting. If you are staying at a hotel away from the city centre where most classic restaurants lie. If you are wary of the hygiene at street food places . If you are squeamish about eating in crowded restaurants, which are non-airconditioned, do not have a loo, where you might have to share a table with others and find it difficult to find a parking spot AND have an expense account, then trying out the regional food in the 5 star hotel you are staying might not be a bad option I must confess. If I go by the Goan food that I had at the Marriott Goa or the Bengali food at ITC Sonar and The Oberoi Grand then I must say that you might eat well. 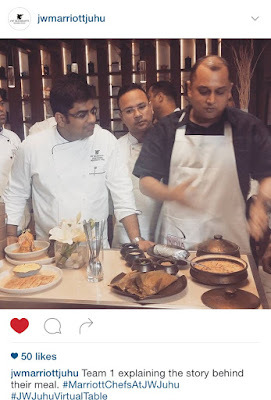 What's the local food that we cooked at the #MarriottChefsAtJWJuhu event you ask? Well we had chefs Marriotts in Mumbai, Bhopal and Agra and a Bengali blogger in me in our group. The Bengali blogger took over of course and we cooked prawn malai curry to go with the coastal theme and then a fish patoori too. I did a Periscope video (these have to be shot in vertical and are broadcast live) of our cook and you can see it here. We had a 2000 Rs budget to shop. Chef Vivek Kalia from Marriott Agra and I went to Godrej Nature's Basket Juhu to shop. We used kasundi from the JW Marriott Kitchen and mustard oil for the patoori. To give it a Bombay touch, I suggested using a pomfret for the patoori. Pomfret is used in the Parsi patrani machhi where it is kept on the bone. Bengali patooris boneless use fillets. I didn't know how to fillet fish. No problem though with so many experts around. 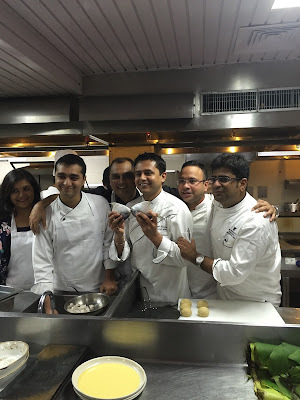 Himanshu Taneja, executive chef of JW Marriott Juhu, who has been named Marriott Global chef of the year, made the fillets. Chef Vivek from Marriott Agra made gur and ajwain parathas for dessert. For rice, we used local ambe mor which is short grained and similar to Bengali Gobondo Bhog rice. We got the fish, prawns and ambe mor at Nature's Basket. They didn't have the kasundi though small kirana shops at bandra stock it. My fellow bloggers and I had a ball of a time cooking with so many exuberant, highly skilled and constantly smiling chefs from across the country. This was my second experience of cooking in a 5 star hotel kitchen in ten days after the chicken curry I made for my granny in the ITC Sonar Kitchen. The only difference was this time it was a live kitchen. What both occasions taught me is that chefs are some of the nicest folks around and are great to hang around with.